<p>Daniel Matsunaga declares \"Filipino ako sa puso.\"
Daniel Matsunaga declares "Filipino ako sa puso." 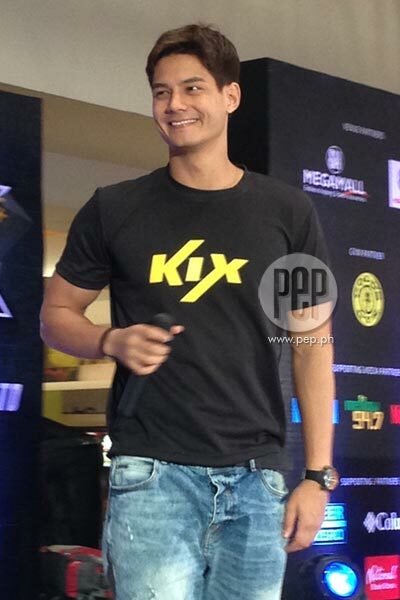 Daniel Matsunaga is set to host the R U Tough Enough Challenge on Kix. To join, entrants must first APPLY ONLINE. Shortlisted participants will be invited to a closed-door audition on August 1, where 10 finalists will be determined. Final showdown will be in SM Megamall on September 5. Daniel Matsunaga is so in love! Yes, with his girlfriend Erich Gonzales, we know, but his first love in the Philippines has always been the country itself. “’Yong pinaka-reason na nandito ako kasi, ah, I really feel like home,” he tells PEP.ph (Philippine Entertainment Portal) at the launch of his newest project with the action channel, Kix, at the Megamall Activity Center on July 8. “I decided to stay here forever because I’m Filipino by heart. “And I’m very proud to say that, because you know, ahh, it’s an amazing country. “I fell in love with the whole thing, like the people here—you guys are so nice, very welcoming. “Umm, food, the weather—I love the weather here too, it’s very similar to Brazil. The host of the R U Tough Enough (RUTE) Challenge Philippines is already a permanent resident of the country as of December 2014, and is working on his application for citizenship. Daniel feels “very blessed” to have surpassed the “challenges” of his career, and he gives thanks to Kix for seeing the “tough guy” in him. “My entire life, ‘di ba, has been a challenge. All the things I did through my career. “And it’s been really crazy. “And it’s really good to be in the position I am today because I get to inspire people. AFTER PBB. Almost a year ago, Daniel was one of the celebrity housemates in Pinoy Big Brother, where he emerged as the grand winner. Daniel recalls his time as a housemate, “It’s an amazing experience. Once you’re inside the house, you know, it’s very different. “That’s why, you know, in this edition now, people cry in the first week. It’s totally different. “It’s an experience you never have here outside, and I got to experience that for four months, ‘di ba? “And I was the Top 1, so I got to win that competition kahit hindi ako Filipino. “I’m very, very proud, and I’m very, very happy that I did it, ‘cause it’s really one of my dreams to be part it. TOUGH GUY. The R U Tough Enough Challenge is a nationwide search for the toughest Pinoy, and Daniel is glad he's perceived as a "tough guy." “Sobrang honored ako to be the ambassador. Una, because, ‘di ba, they really connected me to my lifestyle and being tough. "Since I left Brazil and everything, I went towards my entire career, you know, it’s really tough, it’s really challenging. Daniel left Brazil to pursue his modeling career, which brought him to so many places, getting him exposed to a variety of cultures. His experiences, especially the bad ones, have helped him become a “tough guy." “Well, siguro kasi because I am tough, you know, regarding my entire life. “All the challenges and everything is something that counts a lot, and they really recognized that of me, and I’m very happy. “From Big Brother also, they saw me four months inside the house. “How I live everyday, my everyday routine, ‘di ba? “So, they see that I’m very active, that I never give up, that I always try to inspire people. “I always try to improve myself. PUSONG PINOY. When asked to describe the toughness of a Pinoy, Daniel quickly identified it as the heart of a Filipino. “Well, Filipino ako sa puso,” he says. “I have a lot of Filipino friends, more than Brazilian friends, ‘di ba? “And, ahh, what I found most amazing about Filipino people is that they have this strong heart. “You know, despite of all the calamities, everything that happens to the country, typhoons and everything, you guys, go to rebuild, reconstruct everything, you know, especially those that don’t have houses anymore. “They are happy, and they have this, umm, power in their heart to be better people, to inspire people, ‘di ba? Daniel also appreciates the Filipino’s love for Him. “You guys are very close to God and, you know, I’m a Christian and for me, it’s God in front of everything. “So if he is center of your life, center of your relationship, your lovelife, and center of your work, 'di ba, everything will go into the right end.